Wilderness Advanced First Aid (WAFA) course is designed for outdoor enthusiasts & professionals, preparing them to care for injuries and illnesses in remote, challenging environments. 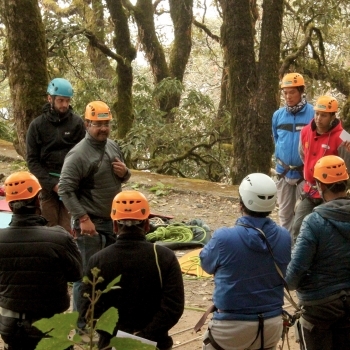 This course is beneficial for individuals who are responsible for friends and family while in the outdoors as well as for those working in travel companies, educational and outdoor organisations, sports and adventure bodies, hospitality industry, offsites-events, relief agencies, disaster management and and rescue forces. The course is fast-paced, challenging, hands-on and fun. Our WAFA course is designed with scenarios at the heart of the learning experience. We emphasise hands-on practice of skills and patient assessments. Our instructors are professional care providers with many years of outdoor leadership experience. In addition to the WFA content, WAFA course focuses more in depth and detail on various topics and scenario-time. Instructors also have more time to coach struggling participants. Skill-set expectation increases from just Life Threats (Scene-Safety & Primary Survey) to Life Threats + Secondary Survey (Head-to-toe to Patient History). Wilderness & Real-life Scenarios - Different props for scenarios (tib-fib fractures, wounds, amputated limbs, avulsed eyes, etc. ), tarps, slings, tapes, ropes, sleeping bags, sleeping pads, wooden poles, back packs, etc are provided by Hanifl Centre.. Ectar Manequins for CPR.